In June 2015, Andrew became the primary preaching pastor at Living Hope Baptist Church (livinghopebaptist.co.za) in Pietermaritzburg, taking over for former HeartCry missionary Dave Webster. Andrew received his M.Div. from the Master's Seminary in the United States in 2011. He and his wife Vicky have two sons: Micah and Asher. The year was 1996. I was 12 years old and had always thought that I was saved. Though I certainly would not have ever said that I was “born saved,” this is basically to what my belief boiled down. The oldest child in my family, I led a life filled with self-righteousness. I thought that I knew all that I needed to know; I very well may have been able to give the dominee [pastor] of our church a theologically correct testimony if he asked for one, and I generally believed that I was fine with God – that I was basically what God expected me to be. One day, I committed some or other sin (I cannot even remember the exact sin); my dad, instead of giving me the rod that I deserved, sent me to my room to think about why I did evil things to others – to think about why I sin. This certainly was not the first time that this had happened, but it was the first time that the thought actually struck me – “But yes, why do I sin?” Being trained in the things of God from a young age, I certainly knew the answer to that question: “It is because I am a sinner – a bad person.” I almost felt overwhelmed by the fact that I could possibly be a bad person, and not at all the “good boy” I had convinced myself that I was. This was truly humbling, and I realized that I needed to go to God and plead for forgiveness of my sin. I knew that He could justly destroy me there and then. I realized that I was not at all smiled upon by God, but was indeed very abominable in His sight. This was the first time that God did look with favor upon me, and He saved me from His just wrath. I knew that God would never cast out a truly penitent one and that, if He forgives sin, He forgives it all forever. This filled me with joy – unspeakable joy. The next day, I woke up with great anticipation to a new day as a new creature cleansed by Jesus Christ. I was excited. From then on, I would do all to my God and not sin anymore – well, at least not purposefully. Sadly, however, before noon I found that I still sinned even when I was trying not to do so. I was again humbled by this, and I realized that being a Christian did not only mean that one is washed from sin by Jesus’ blood, but also that that person must be controlled by the Holy Spirit and not by his own power. Soon after this, my pastor preached through Ephesians 4, and I learned how to live a godly life – to lay aside sin, to change my way of thinking, and to clothe myself with a new godly action and attitude. Since then, that is exactly what God has been doing in my life, day by day making me more like my beloved Savior. And even though I know that I still have a long way to go, I am greatly encouraged that it all depends on a faithful God instead of on me, a helpless human. Looking back, I can say with confidence that the greatest difference between my “before Christ” days and now is the fact that before God saved me, I lived a very holy life – according to my standards and by my strength. Now, as a Christian, I am living a more-and-more holy life by the power of the Holy Spirit, who lives within me. Previously, I was religious; now, I am filled from head to toe with zeal and passion for God and His Kingdom. After my studies, I got a job as a computer programmer, but I silently longed to work fewer hours so that I could put more time every week into ministry. At that time, to me as a young man, “ministry” meant little more than active service in the Young Adults’ ministry of the church, teaching about half the time and counseling some of the young adults who had difficult pasts and pressing trials. Through this service, I was involved with visiting a high school boy who was a paraplegic as a result of a rugby accident. Around the same time, I also heard about a primary school girl who had committed suicide. Even though I did not know these individuals very well, it was through counseling their friends that I realised the significant lack of spiritual hope and perspective among “good Christian people.” Both the boy and the girl were active attenders in “good” churches, but their parents offered little to no hope for their children in their respective trials. My heart echoed the cry of judgment from Hosea 4:6 that a whole generation is destroyed spiritually because they reject the Word of God – which sits on the bookshelves and in the church pews of South Africa. This cry of my heart began to dominate my prayers and personal worship. I soon realized that I needed to discuss my growing desire for full-time ministry with my church elders. Expecting them to hear me out and then coach me through my thoughts and ideas, I was surprised that without any hesitation my pastor replied, “Good! We’ve been waiting for this day.” I realized then that they had sensed a call on my life before I had and that they had been praying to God to convince me at the right time. With their blessing, I went to seminary. By God’s grace, four years later – now blessed with a wife – I was provided with a full-time position at church. It was therefore through my own (albeit very frail) involvement in ministry, and then my pastor’s affirmation, that I understood that God had indeed called me to full-time work in His Kingdom. I am very grateful for such a call, and I pray that the Lord would continue to use me as He sees fit. I was born and raised in a God-fearing family that attended a faithful, solid church in Hillcrest, and from a young age I had a love for the Bible and for God’s people. In my pre-teen years, I would often get frustrated because I wanted to live a “good” life like those around me, but I constantly found myself falling short of the Bible’s standards by fighting with my brother and letting down my parents. The sins of lying, man-pleasing, and pride were rampant in my life even at such a young age. When I was nine years old, my father was diagnosed with an inoperable brain tumor, and his health began to deteriorate. As death became a reality to me and as my dad exhibited such great faith in his Savior, I saw that I too needed a saving relationship with Christ, because my sin would forever separate me from God unless I repented and believed in Him who gave up His life for me and rose again. I can vividly remember sitting in a church service one day and listening to the pastor speak about the futility of trying to live a perfect life without Christ and the joy and help believers have from the Holy Spirit to make us like Jesus. Afterwards, I spoke with my parents about wanting to give my life over to the Lord. I believe this was when I was saved. A few months later, I asked to be baptized in obedience to God, and the elders at Hillcrest Baptist interviewed me to hear about my profession of faith. I was baptized in September of 1995. My father passed away early the next year, and I remember taking such comfort in the fact that he was with Christ in heaven, without pain, and that one day I would see him again. I got involved where I could in church – doing overheads for the music and helping with tea and crèche – and I developed a love for reading and learning about the Word. My family saw a definite change in the way I related to them, and they encouraged me in my faith. Throughout high school, I tried to be a good example to my peers and was a diligent student; but looking back, my spiritual convictions were not very strong, and much of my behavior stemmed from an overprotective, sheltered background rather than my love for Christ. There were very few other young believers at church that could come alongside me, and there was very little ministry by the church to me, so I didn’t grow much in the depth of my faith. When I began attending university, I was determined to be a light for Christ there. I started out strong, but I struggled with the temptations that were suddenly available to me, and I had not learned to be discerning on my own and to flee from sin. I began to think that my parents had been unreasonable in not letting me go out with my friends, and slowly I started to desire more of the world. There was a period of about a year in which I allowed myself to slip into a life that no longer looked any different from the unbelievers around me. This lifestyle did not come without the expense of a very guilty conscience though. I tried to maintain a double lifestyle, thinking that I could enjoy the best of both worlds. I did not understand that my faith required me to be different from the world, and I kept telling myself that I would settle down later in life. 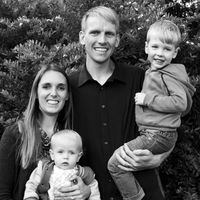 While I was in a serious relationship with an unbeliever, the Lord intervened in my life by bringing Clint Archer to Hillcrest Baptist Church, where he started a young adults’ ministry. For the first time, I observed godliness modeled in a young person’s life, and I saw the contrast between our lifestyles. I was confronted with the realization that as a professing believer, I must either live like one and be different from the world or renounce my faith and do as I pleased. That moment marked a new turning point in my life, and I began to walk faithfully with Him again. Through His grace, I began to grow in my love and worship of Him and made a complete turnaround: I broke up with my boyfriend and began to pour my energy back into my walk with the Lord. I am so thankful that the Lord did not leave me to drown in my sin but brought people into my life who helped me to know how to love and serve Him as I ought. I did struggle for a time as to whether or not I was saved before this turning point, and I sought much counsel as to whether I needed to be baptized again. But I could identify that all along there were definite signs of God working in my life and through my conscience – even through my lowest times – and that there was fruit of salvation before that time too. All in all, I found great joy in knowing that I could now revel in the assurance of my salvation and could enjoy the fruit of the Spirit produced in my life as I faithfully served Him.